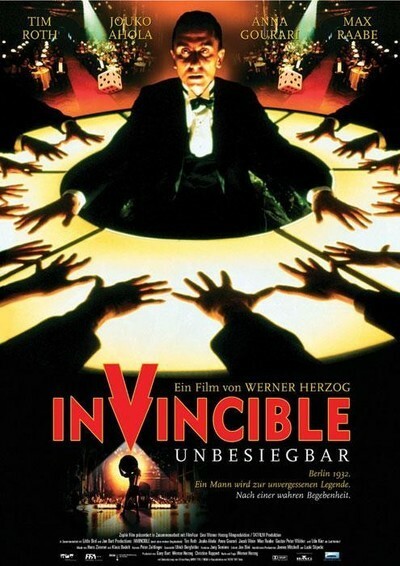 Werner Herzog's "Invincible" tells the astonishing story of a Jewish strongman in Nazi Germany, a man who in his simple goodness believes he can be the "new Samson" and protect his people. He is a blacksmith in Poland in 1932 when discovered by a talent scout, and soon becomes the headliner in the Palace of the Occult, in Berlin, which is run by the sinister Hanussen (Tim Roth), a man who dreams of becoming Minister of the Occult in a Nazi government. The strongman, named Zishe Breitbart, is played by a Finnish athlete named Jouko Ahola, twice winner of the title World's Strongest Man. Much of the movie's uncanny appeal comes from the contrast between Ahola's performance, which is entirely without guile, and Roth's performance, which drips with mannered malevolence. Standing between them is the young woman Marta (Anna Gourari), who is under Hanussen's psychological power, and who the strongman loves. "Invincible" is based, Herzog says, on the true story of Breitbart, whose great strength contradicted the Nazi myth of Aryan superiority. I can imagine a dozen ways in which this story could be told badly, but Herzog has fashioned it into a film of uncommon fascination, in which we often have no idea at all what could possibly happen next. There are countless movies about preludes to the Holocaust, but I can't think of one this innocent, direct and unblinking. In the face of gathering evil, Zishe trusts in human nature, is proud of his heritage, and believes strength and goodness (which he confuses) will triumph. The movie has the power of a great silent film, unafraid of grand gestures and moral absolutes. Its casting of the major characters is crucial, and instinctively correct. Tim Roth is a sinister charlatan, posing as a man with real psychic powers, using trickery and showmanship as he jockeys for position within the emerging Nazi majority. There is a scene where he hypnotizes Marta, and as he stares boldly into the camera I wondered, for a moment, if it was possible to hypnotize a movie audience that way. Late in the film there is a scene where his secrets are revealed, and he makes a speech of chilling, absolute cynicism. Another actor in another movie might have simply gnashed his teeth, but Roth and Herzog take the revelations as an opportunity to show us the self-hatred beneath the deception. As for Jouko Ahola, this untrained actor, who seems by nature to be good-hearted and uncomplicated, may never act again, but he has found the one perfect role, as Maria Falconetti did in "The Passion of Joan of Arc." He embodies the simple strongman. The camera can look as closely as it wants and never find anything false. A naive man from a backward town, not especially devout, he gets into a fight when Polish customers in a restaurant insult him and his little brother as Jews. A little later, entering a circus contest, he watches as the strongman lifts a boulder--and then puts an end to the contest by, lifting the strongman and the boulder. The talent scout takes him to see his first movie. Soon he is in Berlin, where Hanussen sizes him up and says, "We will Aryanize you. A Jew should never be as strong as you." Zishe is outfitted with a blond wig and Nordic helmet, and presented as "Siegfried." He becomes a great favourite of Nazi brownshirts in the audience, as Hanussen prattles about "the strength of the body against the dark powers of the occult." But Zishe's mind works away at the situation until finally he has his solution, tears off the helmet and wig, and identities himself as a Jew. Here as throughout the film Herzog avoids the obvious next scene. Is Hanussen outraged? To a degree. But then he reports: "There's a line three blocks long outside! It's the Jews. They all want to see the new Samson." And then, at a time when Hitler was on the rise but the full measure of Jewish persecution was not yet in view, the Palace of the Occult turns into a dangerous pit where audience members are potentially at one another's throats. This is the first feature in 10 years from Herzog, one of the great visionaries among directors. He strains to break the bonds of film structure in order to surprise us in unexpected ways. His best films unashamedly yearn to lift us into the mythical and the mystical. "Our civilization is starving for new images," he once told me, and in "Invincible" there is an image of a bleak, rocky seashore where the sharp stones are littered with thousands or millions of bright red crabs, all mindlessly scrabbling away on their crabby missions. I think this scene may represent the emerging Nazi hordes, but of course there can be no literal translation. Perhaps Herzog wants to illustrate the implacable Darwinian struggle from which man can rise with good heart and purpose. The strongman in "Invincible" is lovable, and so deeply moving, precisely because he is not a cog in a plot, has no plan, is involved in no machinations, but is simply proud of his parents, proud to be a Jew, in love with the girl, and convinced that God has made him strong for a reason. He may be wrong in his optimism, but his greatest strength is that he will never understand that. The Roth character is equally single-minded, but without hope or purpose--a conniver and manipulator. Watching "Invincible" was a singular experience for me, because it reminded me of the fundamental power that the cinema had for us when we were children. The film exercises the power that fable has for the believing. Herzog has gotten outside the constraints and conventions of ordinary narrative, and addresses us where our credulity keeps its secrets.